The telescopes and cameras are used almost exclusively for photometry. 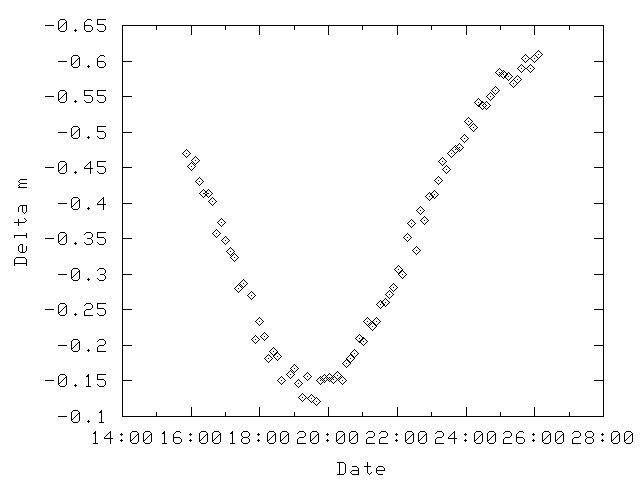 Variable stars, especially cataclysmic variables (CVs), eclipsing binaries (EBs) and RR Lyrae stars are the main targets for CCD observations, although other classes of objects are observed occasionally. One interesting target of opportunity was an eclipse of one of Jupiter's satellites by another satellite. Twice each Jovian orbit (every six years) Jupiter and the earth are aligned such that Jupiter's four major satellites mutually eclipse and/or occult each other. On Feb. 10, 2003, this light curve of Europa's shadow partially eclipsing Io was captured. As of Jan 1, 2018 the primary archive contained 273 CDs and 414 DVDs (DVDs replaced CDs in 2006), holding a total of approximately 1.5TB of images. Both the raw and processed images as well as the extracted star data are archived for possible future reprocessing efforts. The Postgres table containing the image header information for all CDs and DVDs has data on 1,030,098 images, and the photometry table has 38 million rows, with each row representing an individual star measurement.